Resinous, water repelling, high strength white cementitious plaster, that is easily worked for indoor and outdoor surfaces. It does not crack nor burst. Exhibits 15 times less moisture absorbency compared to traditional plasters. 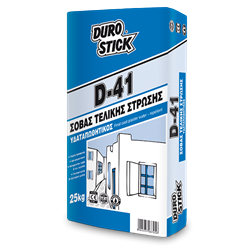 Apply it on wall surfaces made of brick, cement block, aircrete or concrete, that have been coated with scratch and base (brown) coat plaster or with D-40 base/scratch coat plaster, after allowing 5-10 days of curing time. Classified GP: CS III/W2, per EN 998-1.